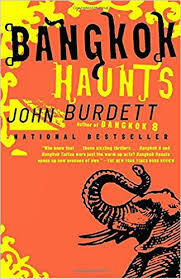 The third novel of John Burdett's procedural series, Bangkok Haunts follows Detective Sonchai Jitpleecheep as he investigates the recorded death of an ex-lover. ...Mr. Burdett doles his out with a witty, idiosyncratic flair, indulging readers’ taste for the exotic, even as he lets them smile knowingly at others’ less-enlightened tastes ...Bangkok Haunts avoids such nonsense, plunging back into the loopy, superstitious chaos of urban Thailand ...Mr. Burdett saves his best moments for on-the-fly details that do more than supply the requisite colorful detail, hinting at a writer with a generous affection for Thai culture ...does much better with Thais than Westerners, especially Americans, and especially the love-starved, high-strung F.B.I. agent Kimberley Jones, a hopelessly irritating stock character in need of a kill-off if ever there was one ...a book to be gobbled up at top speed, preferably while wearing sunglasses and drinking through a twisty straw. The inhaler is optional. It is rotten to the core, as it's convincingly portrayed in a wonderful mystery series that is at once sprightly and densely layered, like the Thais themselves ... Haunts in this third of the Sonchai series acts as both noun and verb ...central crime in Bangkok Haunts is the murder by strangulation of a prostitute whom Sonchai once was nuts about ... What never falter are Sonchai's captivating, sometimes teasing voice ––– he often addresses the reader as 'farang' (the Thai word for Westerner) and Burdett's affectionate take on everything visiting farangs find fascinatingly upside down and backward in Thailand ... In Burdett's always amazing Thailand, euphemism is reserved for the sinister. Sonchai Jitpleecheep, John Burdett's flexible, morally solid embodiment of the modern man, navigates particularly treacherous waters in the spellbinding Bangkok Haunts, his third thriller with Sonchai at its core. To conjure Burdett's unique blend of garishness and gravitas, imagine a Conrad novel transformed into a video game ... Burdett is equally good with male and female characters ...while celebrating an Asian sensuality at odds with some Western notions of morality, is an angry, purgative book ... With Sonchai's relationships as its backbone, this is a book of many currents. It's about differences between West and East, intersections of the sexes, and the relation of man and beast. What did you think of Bangkok Haunts?